The Geek Squad replaced my laptop hinges and hard drive. Still under warranty! Unlike Michelle, I had no problems. Conventional tightwad wisdom says to avoid extended warranties, but I find them essential on any new electronics or appliances. Our most basic fridge has required 3 repairs so far! What did I cook in Florida? Easy meals like spaghetti with meatballs supplemented restaurant trips. I also bought a lot of fresh Florida produce like corn and strawberries. Mmm! The only downers were that Elise didn't sleep a wink (hello, Zombie Mom!) and my stroller was stolen at a fancy resort. Oh, well, I bought it at the Unclaimed Baggage Depot in the first place. Our Easter brunch is pictured below. I kept things simple out of necessity: slices of ham, artichoke frittata for the vegetarians, steamed asparagus, strawberries, and left-on-the-counter-for-vacation banana bread. My husband surprised me with astromeria lilies from the grocery ($4). They made a frugal centerpiece when combined with a yard sale urn, reused Oasis, and moss and spring twigs. What looks like a hole is actually a little bird nest with egg. Everything you see on the table is secondhand. I just bought the tongs for $1 and the oval asparagus dish for 50 cents. I'm glad you had a nice trip to see your brother, even if your daughter didn't sleep and the stroller was stolen. It's good that you can have a good attitude about it. Was Elise sick or just not used to a new place? I hope she's sleeping now that y'all are back home! Glad to see you back! And glad you had a nice trip. I look forward to seeing you pop up on my Google Reader more often! Meredith, I love your blog. I love how you turn ordinary into extraordinary with such seeming ease. You remind me of Gladys Tabor, and from me, that is the highest honor! My goal this spring and summer is to learn to make my home prettier, and more comfy with things I already own! I pride myself on being cheap but after reviewing your blog (I especially love how you tell me how much stuff costs, because often my idea of cheap and someone elses idea of cheap are $50 apart I'm at $2 and they are at $52!...lol)Anyways, I can see that I have failed to do the best I can with the money we have. I can see that in your blog! That I need to return to garage sale & thrift shopping. It's easy to get away from it when you add kids and move to the country. But thanks to you I picked up a "new to us" lunch box for my hubby worth $8.84 at Wal-Mart for .50. Thanks for the inspiration. I am also going to start pricing things on my item so folks can see you need to go to Nordstroms (or even Wal-mart) unless that's the name of the lady that owns the 2nd hand store! You have inspired me to do better and to beautify my home on a shoe string and to even look at Wal-Mart and the $1 store as my last not first resort. Thanks! Welcome home! I hope you had a nice time. Sorry to hear about your stroller. I hope you have a backup! (Was it you who found a great stroller at Goodwill for $30 or so? I can't remember...but I hope so!). You are a marvel! I can never let my husband find this blog because he'll be all like "See? You could totally do stuff like that. Have you EVER paid 50 cents for something?" I'd never hear the end. I'll secretly try to be better! I am glad you enjoyed your trip and Easter. I am fairly new to your blog but have enjoyed it immensely so far. We live in Los Angeles which can be an expensive city and there is a great deal of keeping up with the Joneses that I struggle to avoid. I am trying to raise my children to be active producers in society, not just consumers. Reading your day-to-day experiences is a breath of fresh air! Thank you. So glad everything worked out with your computer. Mine died a week after the warranty was up! That is one area I have become very frugal about. I had a palm pilot and loved it...until three years later it was so outdated that it no longer worked with my new computer. So, it's back to a regular old address book for me. Some of these things become obsolete too fast for my tastes! The Easter table is beautiful! So glad you had a better Geek Squad experience than I did! Hoping that they fix it quickly and correctly this time. 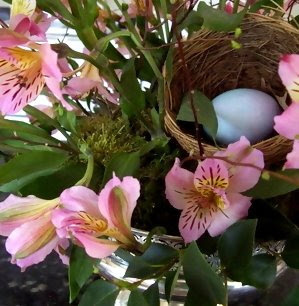 Your Easter table was lovely - you are always so creative! And I didn't know about the unclaimed baggage place...might check it out if we ever wander down that direction for another purpose. My daughter doesn't sleep well and almost never sleeps when she's not in her own bed. This, while frustrating, enables some extra frugality in us - we never want to go anywhere! Just the thought of turning into "Zombie Mom" on what is supposed to be a vacation makes me want to shove our suitcases further into the closet. I sure wanted to drop into to your blog and say hello, so glad your trip went well. Sorry you lost the stroller. I hope the baby is not ill, that it was just because she was in a different bed that she did not sleep well. Your Easter table was just beautiful. I do not know why, but I am drawn to oval bowls and plates when I see them second hand. I have several all over my home that I have picked up here and there for next to nothing. One sits center of my stove as a spoon rest, another is in my bathroom holding all of my soaps. Still another sits on my dresser and holds my make up. They are pretty. I'm so sorry your stroller was stolen! I just can't imagine who would steal a stroller! Can you really reuse oasis? Welcome back, Meredith! You were missed. Lovely Easter table and what a wonderful Spring menu. Once again, thanks for sharing your life, ideas and finds. You have inspired me to seek beauty in all that I do. I reuse mine at least once. I've had this block of it on my back steps for a month now. It had dried out completely. I resoaked it, letting it sink into the water so I knew it was absorbed. Then I flipped it over so that the holey side I used on top last time is now on the bottom. I wouldn't do this for a big event or anything, but for a simple home arrangement when you need a little quick support--totally okay!!! Glad you're back and can't wait to see your future posts! I remember those road trips when MY beautiful baby girl wouldn't sleep. Now she's 16 and sleeps half the day on the weekends. The moral is, this too will pass! I'm loving your secondhand silver. Saw a pretty round silver tray for $2.00 at the local Goodwill a couple of weeks ago - the center was engraved with a personalized remembrance from the 1970's - I should have purchased it and used a doily or something to cover the message. I thought of you and realized that the tray just MIGHT last until the next 99 cent sale. Your presentation was lovely but it seems there was not an abundance of food, especially if you had guests. Was there plenty and was everyone ok with no dessert? I don't mean this to be critical; it is a real question. I just have this mindset that there must be lots of food for a holiday meal, including at least one fabulous dessert. My frugality would come in using up the lefovers. Maybe I am in the minority with this thinking. Your dd is so cute, can't believe how big she looks! The arrangement is lovely, the food looks scrumptious. Computers... I really really really want a laptop, but I've decided that the "portability" factor doesn't outweigh the negatives, such as greater expense, the need to buy a warranty. I'm fortunate that my dh can build our own computers for us, by ordering the components and assembling it himself. He's been doing this for about 15 years, and we've only had one "catastrophic" incident where he couldn't fix it himself, a hard-drive failure. So I will be getting a top of the line computer for less than the cost of comparable Dell before too long I hope! (Dh thinks for about $600 including new monitor). Haven't had my own computer in years, so I'm looking forward to that! Elise is absolutely beautiful!! You do such a wonderful job of dressing her femininely. 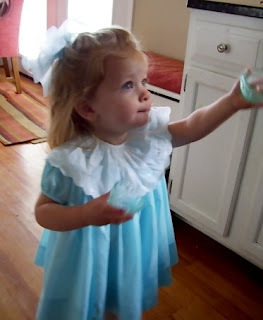 It has inspired me to find more dresses for my little girl. Glad you had a nice time on vacation! There was more food than what showed in the picture. I snapped the photo while the ham and frittatta were in the oven still. There was PLENTY of food. Enough that I was sending home leftovers with people. Plus, the frittata was very rich, with lots of cheese and egg. I didn't want to do an egg-rich dessert after that. I thought the strawberries and super-moist banana bread were sweet enough for a morning brunch. The reason I kept things simple was NOT out of frugality but because we had returned from an 8 hour drive the night before. IN fact, one of my guest's thank you notes said "Your brunch was delicious but not so good for my diet!" What a beautiful picture of your little girl. I'm sure there is an inspiring, frugal story behind the lovely dress, too! welcome back Meredith; Elise looks so cute in the aqua dress. and sorry about your stroller...at an upscale resort at that! I once had a BIBLE stolen, irony of ironies. Yay Meredith is back. I love being away for holidays - I think they are actually more simple. 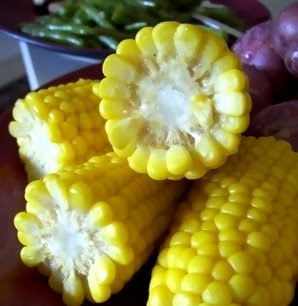 Love the corn pix! You just take what you have - and make it work! No worries!! I feel the same about Unclaimed baggage, it was not what I wanted it to be. I think I can find better stuff at the yard sales in my neighborhood.